David Nash has undertaken a wide variety of furniture making and restoration projects since the mid 1990's and he is happy to discuss any potential work that you have to offer. Any type of furniture making/restoration/repair job is considered and please look through previous work, in the Gallery, to get an idea of what can be achieved. Bespoke TV Lift cabinets made to measure. Furniture Modifications – shorten/lengthen tables, sideboards etc. Re-polish or paint kitchen cupboard doors and other fitted kitchen furniture. 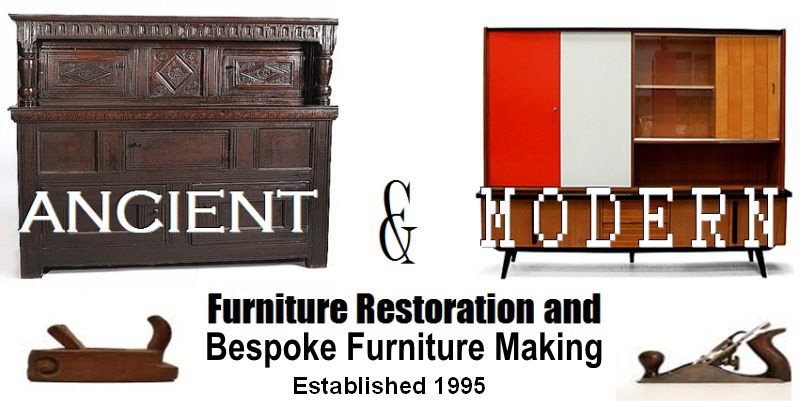 “Ancient and Modern” has a workshop in Hartshorne, Derbyshire, and provides furniture restoration, repair and bespoke furniture making to Ashby de la Zouch, Coalville, Loughborough, Swadlincote, Burton on Trent, Leicestershire, Derbyshire and the East Midlands.